Bobcat has launched the company’s new EVO generation of Stage IIIB/Tier 4 interim rotary telescopic handlers, providing a major step forward in the design of rotary telehandler products worldwide. The new EVO range from Bobcat comprises four models – the TR38160, TR50190, TR50210 and TR40250 rotary telehandlers, providing maximum lifting heights of 15.7, 18.7, 20.5 and 24.1 m, respectively. The new EVO rotary telehandlers have been designed as easy-to-use machines, combining more comfortable and safer operation with the latest developments in the field and a wide range of new features, offering higher performance and increased productivity. The TR38160 EVO model is powered by the Kubota V-3800 DI T 3.8 L 4-cylinder Stage IIIB/Tier 4 interim compliant diesel engine providing 74.5 kW (100 HP) of power at a rated speed of 2600 RPM. 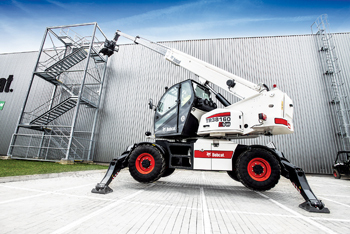 The new telehandler offers a maximum lifting capacity of 3.8 tonnes and a maximum horizontal reach of 13.4 m.
The TR50190, TR50210 and TR40250 models are powered by the FPT-NEF Series 4.5L Stage IIIB/Tier 4 interim diesel engine with an output of 105 kW (141 HP). The TR50190 and TR50210 models both have a lift capacity of 5.0 tonnes, whilst the TR40250 telehandler has lift capacity of 4.0 tonnes. The maximum horizontal reach in the three models is 16.4, 18.0 and 20.5 m.
The 400o rotating capability of the TR38160 model and the 360o turntable rotation available in the TR50190, TR50210 and TR40250 telehandlers allow the machines to serve the needs of an entire site from just one position. Capable of being set up in a matter of minutes, the new EVO generation telehandlers offer exceptional stability for lifting heavy materials either vertically up to a roof or horizontally onto the edge of an excavated site, reducing construction time and costs and increasing safety and efficiency on site. An auto wheels alignment feature, which is optional on the TR38160 model and standard on the other three models, allows the operator to easily change the steering modes – the three autoalignment steering modes provide excellent manoeuvrability, even in tight and difficult working environments. The stabilisers have both individual and all at once activation to ensure machine stability in all types of terrain. Full operation control for the stabilisers and position indicators are provided on the control panel. Another Bobcat product was in the news recently. Hemswell Surfacing Ltd, based near Gainsborough in Lincolnshire in the UK, has purchased a new generation Bobcat S550H high flow skid-steer loader together with new Bobcat sweeper and bucket attachments from AMS Bobcat, the local authorised Bobcat dealer based in Scunthorpe in Lincolnshire. Like all Bobcat compact loaders, the S550H loader is equipped with the quick-change Bob-Tach attachment mounting system, allowing it to be combined quickly and safely with over 70 different families of Bobcat attachments, delivering versatility and time-saving efficiency across a huge range of different applications.